PROGRANT WORKSHOPS OFFERED: 1. “Sneaky Math” Workshop – Math is a big part of our everyday lives, and because of that, “sneaking” Math into our children’s lives is easy to do. This workshop will give you tips and tricks to incorporating Math into your daily routines. 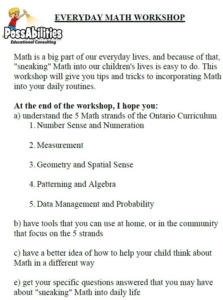 The goals of the workshop are to: a) understand the 5 Math strands of the Ontario Curriculum Number Sense and Numeration Geometry and Spatial Sense Patterning and Algebra Data Management and Probability b) have tools that you can use at home, in the car, or in the community that focus on the 5 strands c) have a better idea of how to help your child think about Math in a different way d) get your specific questions answered that you may have about “sneaking” Math into daily life Perfect for Parents in Grades JK-8 2. Learning Styles Workshop – Curious how your child learns? Are you sick of fighting about homework? Understanding your child’s learn style can often help alleviate some of the conflict that occurs during homework time. Is your child a visual, auditory or kinesthetic learner? 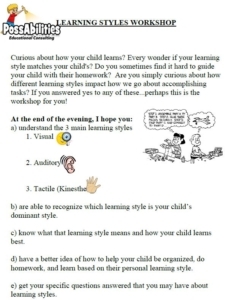 Using a child’s dominant style should influence how the homework is achieved. An auditory learner will learn their times tables best by hearing them, listening to them and saying them back over and over. A visual learner will learn them best by seeing patterns, by looking at the tricks, by visualizing the groups. A kinesthetic learner will learn them best by moving around, shooting a basketball while saying them, using cards to flip, dice to roll and counting on their fingers perhaps even while chewing gum or playing with a stress reliever toy. Students come with their parents to this evening workshop. Students will take a learning styles inventory and then move around to different stations in the room to explore how they learn. There will be a Math, Science, Spelling, and At Home responsibilites stations set up for students to try based on their learning style. Perfect for Parents with their child in Grades 4-8 3. Other worskhops available upon request to suit the needs of your school parent body. TEACHER PROFESSIONAL DEVELOPMENT WORKSHOPS: 1. Spelling Workshop – Demystifying the English Language. Are you sick of answering “just because” when your student asks why is spelled like that, or is spelled like that? 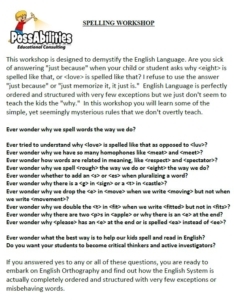 I refuse to use the answer “just because” or “just memorize it, it just is.” English Language is perfectly ordered and structured with very few exceptions but we just don’t seem to teach the kids the “why.” In this workshop you will learn some of the simple, yet seemingly mysterious rules that we don’t overtly teach. For example: is a trigraph (3 letters that make 1 sound) and it says long like in , , BUT when we put an or in front of it, the trigraph become a long sound. The spelling of makes perfect sense once you know that simple rule. No English word ends in so if it comes at the end, we use . In English you can never have a and side by side and when you can’t use a in English, you use an . Now it explains the spelling of . Want to know more? Book this workshop and demystify spelling for your students. 2. 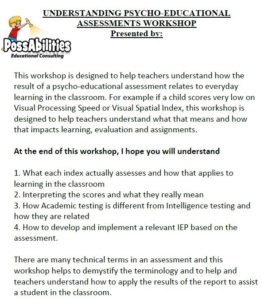 Understanding Psycho-Educational Assessments – Understanding these reports is crucial to implementing a proper IEP. Learn how the undersand the results of the Assessment directly affect learning in the classroom. Every wonder what weak fluid reasoning skills mean in terms of every day classroom learing? How does it affect your student’s ability to succeed and more importantly what strategies should be implemented in the classroom in order to help a student with a weakness in this area? This worskhop will give concrete explanations and real life classroom applications to understanding Psycho-Educational Reports and how to best help children succeed in daily learning. TO BOOK ANY OF THESE WORKSHOPS, PLEASE CALL SHARON AT 613-316-6457 TODAY!